BITTERSWEET COLOURS is one year old !!! I have to thank to all of you for the entire support, comments and for enjoying this wonderful journey by my side. I built wonderful friendships and I had the pleasure to welcome great opportunities in this year. As you can see I wore this adorable dress thanks to BHLDN.com ( a website where you can find amazing garments and accessories for special occasions). Personally, I'm in love with the delicate bridal lingerie HERE, the vintage inspired shoes in all the colors HERE and of course all the bride reception and wedding dresses HERE and HERE. I think you will see what I'm talking about when you will visit this special shop, and I will love to know what you think ! And now I have to give something away in order to feel this celebration! One lucky winner will win a similar dress to mine ! All you have to do is to be a follower of Bittersweet Colours blog with Google Friend Connect or Facebook ( HERE) and to let a message below with your name and email address. That's it! This giveaway is world wide and it will end on September 5th . Happy Anniversary sweety!! It’s amazing what one year of blogging can do both in your life and your readers!! I know you are a great source of inspo and I’m always happy to be one of your avid followers!! I´m from Portugal, my name is Sara and I follow you with my blog juntoajanela.blogspot.com (juntoajanela@gmail.com). The dress and the overall look is gorgeous! Happy 1 Year Anniversary, Bittersweet Colours! Oh, Happy happy haaaappy anniversary, darling!!! Cheers to all the exquisite outfits and beautiful smiles! I am your GFC friend for a long time, and just LOVE this dress!! The colour is perfect for you, the winner can chose a color?? ?OMG, I want to be ME!!!!!!! HAPPY B day for your wonderful blog, you are my DAILY visit and inspiration! One day I want to be and look like you!!! Once more a big kiss to your wonderful photographer! he is great!!! love this dress of yours! Happy Blog Anniversary and stay gorgeous! Happy blog anniversary dear! Great dress! hey my name is Tanya! I’m your new follower GFC Tanya_Soyer! Hello. I love the dress! You look fabulous as usual. Great dress. Fantastic color. I’m sucker for yellow :-). Do you know what the style name of the shoes is? I’m wondering if they are still available in store.The Michael Antonio one are way too high. hey dear, congrats to your blog birthday! i love your blog so much, it’s a big inspiration for me. i would like to win this gorgeous dress- it’s fantastic. Congratulations!I really enjoy visiting your blog & admire the outfits you present!Many wishes for even more success in every way of your life! Thank you for the chance you give s to win a lovely dress like this! That dress is so classic. I am now following you on facebook. Congrats! Looking forward to many more years of blogging and great posts and outfits! U r beutiful ! Dress is amazing ! congratulations!!! have a nice day! Followed with Google Friend Connect. Great look – your photos are beautiful. Congrats!! Your blog is amazing, and these pics are gorgeous! I’m already following you with GFC, Bloglovin, and Facebook. love this combo of orange and pink! Happy Anniversary! It has been a great year for your blog. i follow your blog on google reader!! Hope i win! You look perfectly in this bright yellow dress! Wonderful photos! You look beautiful darling, congrats! It is so beautiful dress!! I am really in love!! you look stunning in these shots and I always love your style – from strength to strength – well done! such a cute look! its so retro. happy birthday to your awesome blog!!! I just love that dress! It is so MadMen!!! Happy birthday to your great blog! You look very elegant and classy. I really love your dress. Feliz aniversario. Me encanta tu blog y no me pierdo ninguna entrada. Enhorabuena. This dress is more than beautiful, but It won’t be easy sending it to Spain. hi, this is a beautiful dress! Congrats with the anniversary! Congratulations! May you have many more years of sharing the emotions and the beauty with us on this blog! Happy blog anniversary hun! Beautiful pictures, beautiful dress! Congratulations and have a lovely day! I’ve been enjoying your blog for months now, and I follow you on facebook. I LOVE your style. It’s so unique– put together but also laid back at times. The dress in today’s post is fabulous! Love this dress, the 50’s shape is gorgeous. Please consider me entered – I just ADORE that dress!! 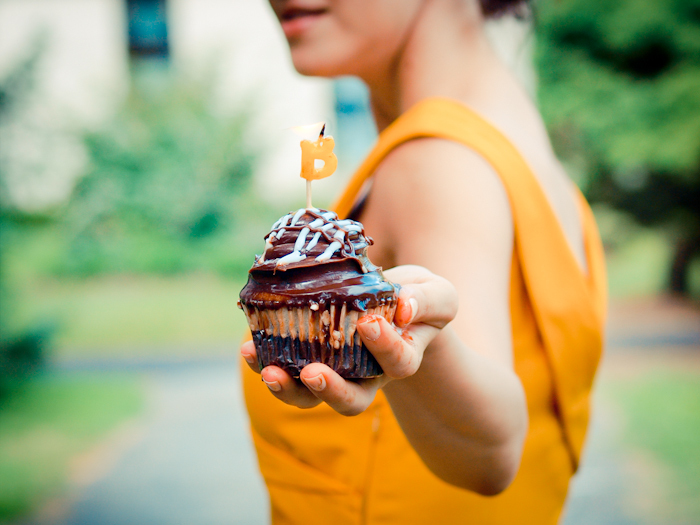 The colour looks divine on you and the shape is so pretty… plus happy bloggiversary! La multi ani blogului tau!!! Stupid me, nici nu stiam ca ai fb, ajung acasa si-l studiez mai bine, imi plac la nebunie outfiturile tale si acolo sigur le vad mai usor :P.
Ti-am dat like cu Federova Kik si-ti urmaresc blogul cu numele federova. What a cute dress and great giveaway; I follow you via GFC, FB, and Polyvore…wish me luck! Love your style and this dress is.. stunning! Congratulation on the blog’s first birthday. Congratulations & happy birthday ! Happy Bloggiversary! !I’m loving this yellow dress!! I read your blog from Colombia and love it! !